As the leader of your contact center you are under constant pressure to improve agent performance. But is it really about improved performance or is about meeting and exceeding goals that senior management has put in place for the contact center. Depending on the industry it could be incoming increase revenue or reduce outgoing payments. What we come to realize, in the contact center, is that agents, team leaders and even you the manager are caught, off guard and unaware of the jump in customers contacting the business. Fifteen, twenty years ago customers called us and we were quickly alerted by the flashing red light mounted to the cubicles in the call center. In today’s world customers are emailing, sending chat messages or going out to social media. This is how the contact center can be thought of as unaware and not taking care of the customer. How do we eliminate this “not aware” problem? What can we do to provide agents, supervisors and even ourselves with the information we need to be made aware? We have choices that we need to make to improve, maintain or exceed our business goals. 1. Who is the audience for the LCD Screens? a. How many will you need to have for your audience to see the screens? b. Do the supervisors and managers walk the floor and need to see this content because they are not at their desks? c. Is mobile not allowed in your contact center? 2. What content is needed to improve performance and can that content be displayed? 3. Weather, traffic, social content is needed do your internal policies allow for this content? 4. Will your budget cover the software, hardware and hardware installation? Data can be combined together showing the agents that current status of critical KPI’s such as the emails and chats waiting to be answered. The positive or negative social media posts that need addressing. Going beyond the usual contact center data having the LCD screens to communicate with the agents provides added value to the daily job the agents must endure. Data from multiple sources combined together into a single report makes it quick and easy for anyone to see the current status. It does not matter the method in which the customer is trying to contact you because you are now immediately aware of the status. Questions that you need to answer: 1. Can you combine the data together into a single dashboard? 2. Will the right people have access to the dashboard? 3. Can you segregate the data to the correct audiences?Dashboards if properly designed will provide the best information for its audience. The design of the dashboard must also meet the audience’s personality. Some people are unable to review a lot of data and want critical stats in graphs and charts. Others do not want graphic input they only want data. 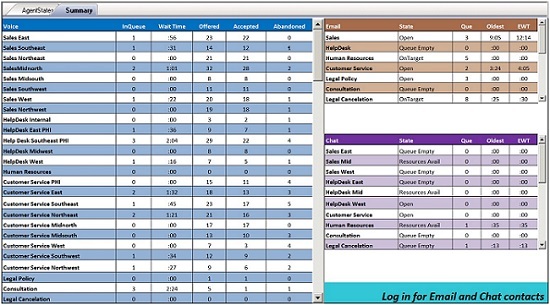 Dashboards are able to eliminate, solve and or reduce problems for just about every call center. Are you willing and able to combine data together in a format that works for you? 1 1. If the agents have this desktop wallboard will they read it and react to it? 2. 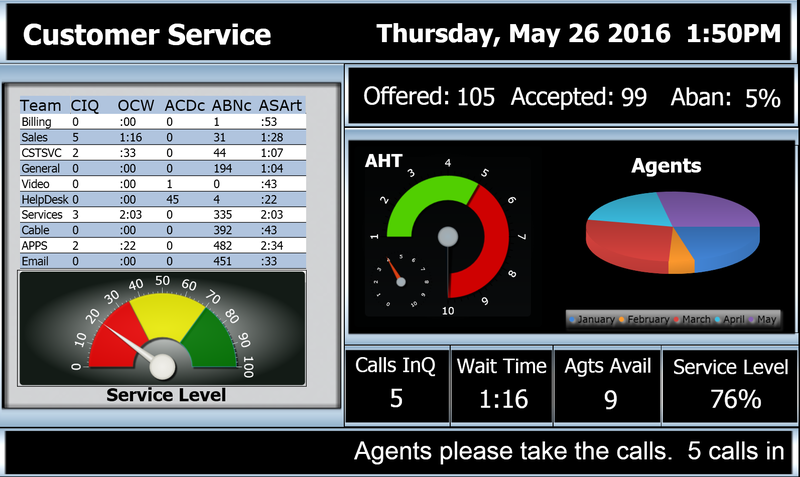 Will the desktop wallboard have the proper data for the agents? 3. Will one more application on the agents desktop overwhelm the agent? Agents are always working heads down. They are focused on the current customer and the applications they are working. Having an alert on the phone works only if it is for calls waiting and the agent is looking at the phone for a blinking LED light. Giving the alert notice to the agent who is looking at their screen will improve performance. 1. Do you have access to your desktop 100% of the time while you are working? Of course not. 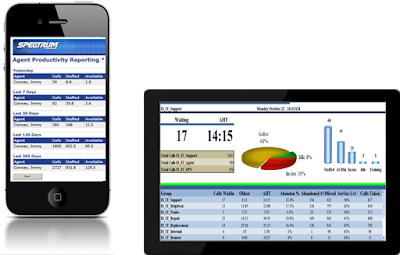 You are mobile so having access to the critical data at all times manages the performance of the contact center. 2. While being mobile do you need to know the status of the contact center? 3. Do you need quick drill down access to multiple layers of data? 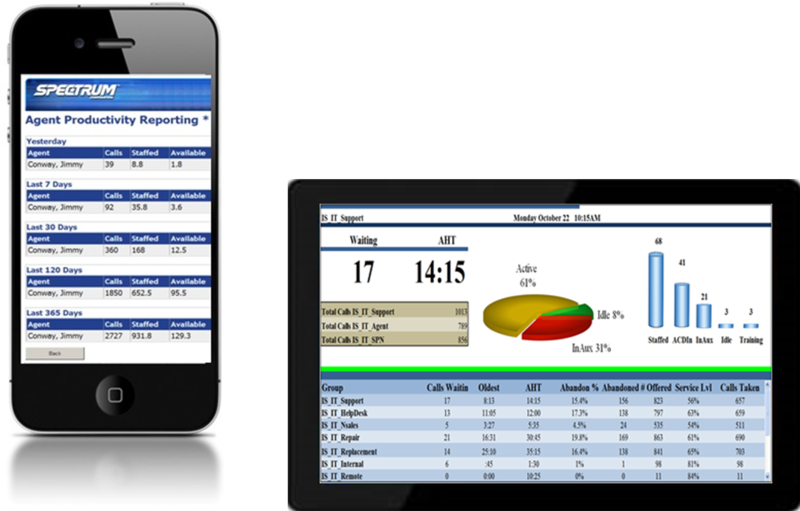 Web based reporting allows for easy mobility for key team members. The reporting may not be pretty pictures with graphs and charts but it does contain the crucial data that offers team members quick solutions to the daily challenges. In the real estate industry it is all about location, location, location. For the contact center industry we have decisions, decisions, decisions. Which direction you should go is funded by the budget and anticipated outcome. If the direction needs to be contact center improvement in daily functionality then reporting is the proper direction for you to go. Labels: agent desktops, agent metrics, agent statistics, at home agents, call center dashboards, Call center digital signage, call center metrics, call center reporting, call center wallboards.